Following a successful keynote speaker appearance at their annual conference, Redpoint was asked by Hospitality Newfoundland & Labrador (HNL) to create and lead a one-day workshop that could be delivered road show style in multiple locations throughout the province. This project sprung from dual mandates of both HNL and the province to improve the competitiveness, quality, and market readiness of their tourism industry. Now…mandates are all well and good, but in order to inspire attendance and engage attendees, some unexpected fun needs to be added to the equation. 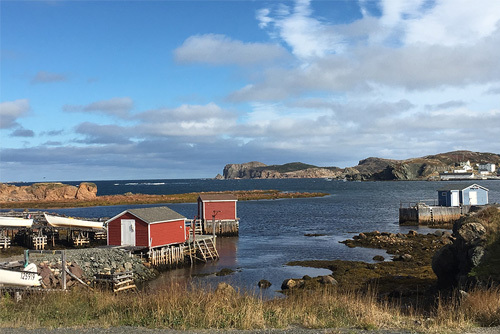 However…a full day (9am-4pm) of intense classroom learning is a tough ask for a bunch of operators who are used to being outdoors in a stunning destination like Newfoundland. So, in each of the three locations, we planned a delicious surprise for attendees during the afternoon break…from cookie decorating, to liquor bar, to a pie-and-ice-cream buffet. A spoonful of sugar (or liquor) surely does help the medicine go down, and in this case, attendees were riveted to the presentations right up until the very last slide. Material was custom-crafted to align with Newfoundland & Labrador tourism businesses, including sessions like Product Development with a Purpose – Setting Your Business Apart, Guest Relations – Make Relationships Not Transactions, Taming Cyberspace – Which Online Stuff Really Matters, and Creative Marketing – Think More, Spend Less. Check out the promo video that HNL distributed in advance, during which Redpoint’s Newfoundland puffin mascot Sebastian makes his formal debut.